to engage the Power of Spirit, and to manifest our best in the Human community. with learning to create personal and communal rituals. Carnival of the Spirit, and On Holy Ground: Commitment and Devotion to Sacred Land. 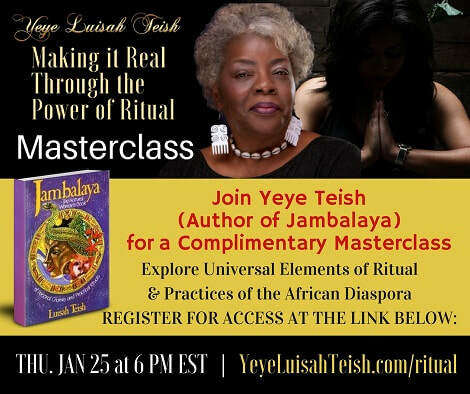 Yeye Luisah Teish is a globally revered Yoruba Priestess, Storyteller, and Teacher. She is author of the best-selling book and spiritual development text, Jambalaya: The Natural Woman's Book of Personal Charms and Practical Rituals. ​access details to attend yeye teish's masterclass. also you will receive priority email updates.